Did problems with SSDI cause the Output-Jobs Disconnect? In a New York Times blog, Nancy Folbre recently discussed the alarming disconnect between economic growth and job creation in the United States. While the economy has been growing since the Great Recession’s end in 2009, the employment rate remains stuck at its December 2009 level of 58 percent. This percentage had reached 65 percent during the boom leading up to the 2001 recession—a level not seen since then. The slow recoveries of the job market after the last two recessions have fostered a concern among many that the link between economic growth and job creation has been severed, a phenomenon that might be called the American Output-Jobs Disconnect. 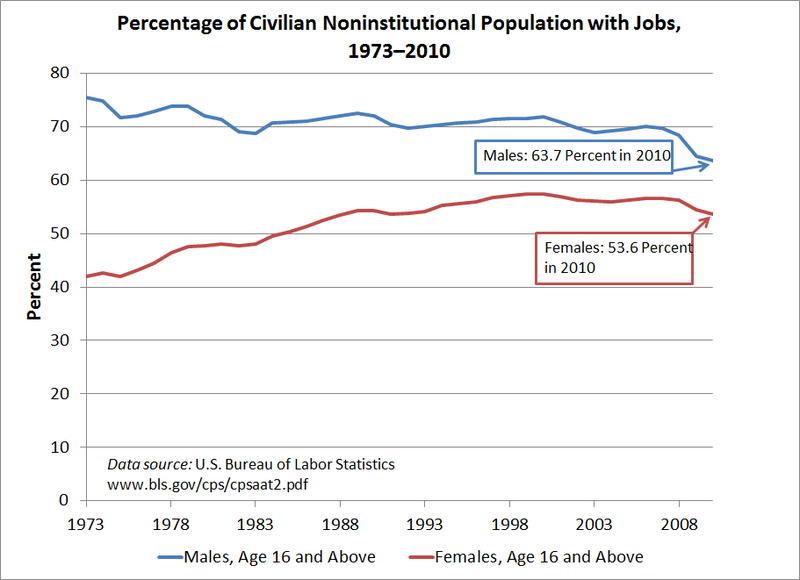 Chart 1 at the top of this post illustrates this turning point in the employment rate (employed persons divided by population). 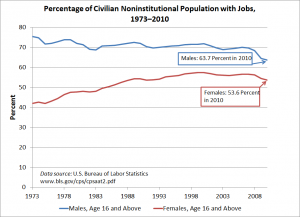 The blue line shows the employment rate for males plunging from 71.9 percent in 2000 to 63.7 in 2010, while the red line depicts the rate for females falling from 57.5 percent to 53.6 percent during the same 11-year interval. Reading an interesting proposal from the Center on American Progress (CAP) and the Hamilton Project to reform the Social Security disability program, also known as SSDI, I noticed this chart, which seemed relevant to the same topic. 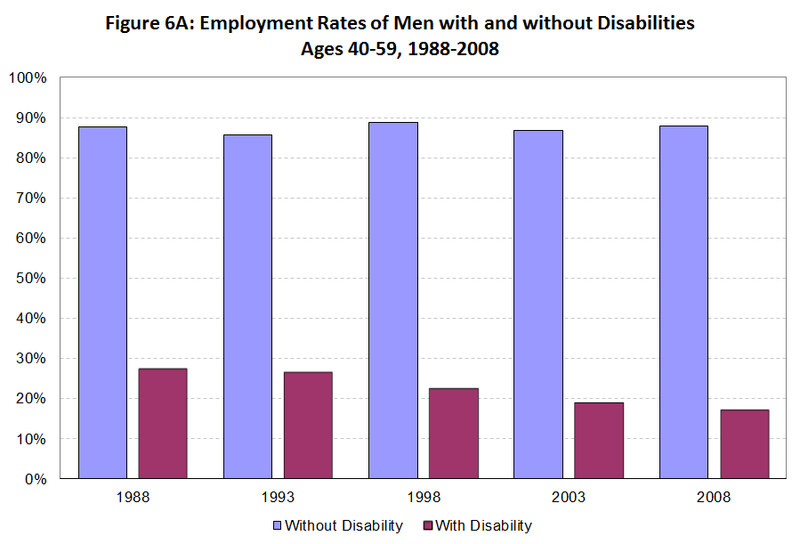 Chart 2 above shows that among men aged 40 to 59, employment rates for those who do not report having a disability were approximately the same in 2008 as they were in 1988, while the percentage of disabled men who are working fell from 27 percent in 1988 to 17 percent in 2008. It is remarkable that the decline in the employment rate for men aged 40-59 can be accounted for almost entirely by a fall in the employment rate for the disabled members of this group, at least for the period 1988–2008. Another well-known fact seen earlier in Chart 1 is that employment rates for women rose dramatically until approximately the year 2000. In Chart 3 (just below this paragraph), also from the CAP-Hamilton proposal, one finds that what was true for women in general was not true for disabled women, at least in one age group. 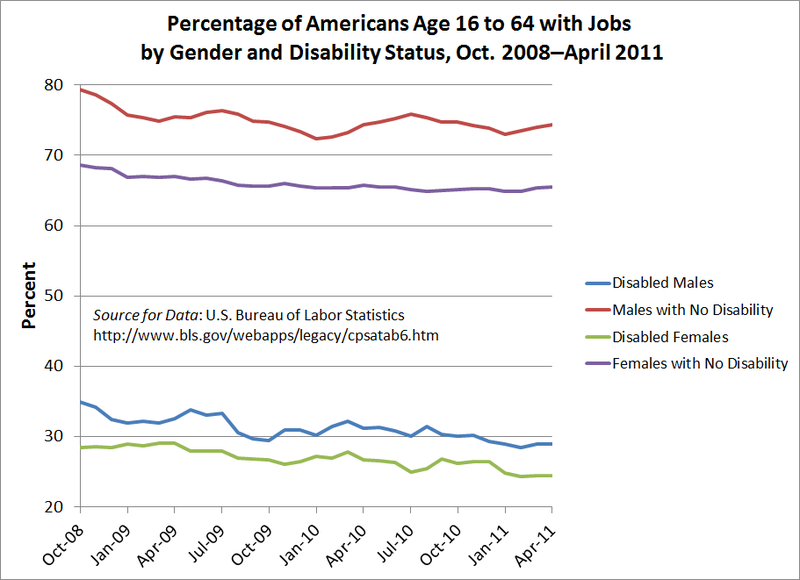 The employment rate for disabled women aged 40-59 was only 16 percent in 2008, compared to 18 percent in 1988. CAP and the Hamilton Project argue in the paper that the long-run fall in the employment rate for disabled people can be blamed largely on the design of the Social Security disability program. This problem is one of the many issues that motivate the paper’s proposal for a “front-end” disability benefit. The proposed disability benefits are designed to be quickly obtainable after the onset of disability and to encourage a quick return to the workforce when one is possible. More recently, this proposal, along with a number of other issues related to the Social Security disability program, were discussed in this article by Motoko Rich in the New York Times. The New York Times article quotes some experts who question the importance of problems with the Social Security disability program as factors in recent employment trends. While reading Folbre’s blog post last week, I realized that a disabled–nondisabled breakdown of employment rates might also shed some light on the post-recession employment issue mentioned by Folbre. To wit: did the recovery from the 2007–09 downturn improve employment rates for the disabled or nondisabled subgroups of either gender, in spite of the ongoing slump in the overall employment rates for both males and females of working age? This question was addressed in a fascinating article in the BLS’s Monthly Labor Review (MLR) last fall, which focused on the thesis that the recession disproportionately affected the job-market prospects of disabled workers. The article found declining employment rates for both disabled and nondisabled Americans. We have created Chart 4 below using BLS data similar to those analyzed in the MLR article but for a broader age group, namely ages 16 to 64, and for an updated dataset. Given the findings reported in the MLR article, it is not surprising to find a sharp decline in employment rates for all four subpopulations depicted in Chart 4: male and female disabled people, as well as males and females without disabilities. The data series shown in Chart 4 are among many pieces of evidence against any theory that the largest drops shown in our charts can be explained mostly by a structural or long-term change in disability policy. 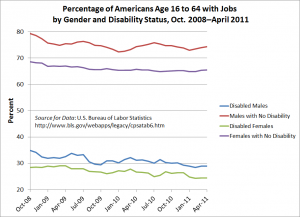 To wit: at least since 2008, the ongoing fall in the probability of being employed has strongly affected the job prospects of both disabled and nondisabled people of both genders. Also, the acceleration of the declines shown in Chart 1 starting in 2007, as well as the substantial decreases shown in Chart 4 for 2008 to the present, hints at an important and negative role for the recent recession and the weakness of the current recovery. Hence, a new government jobs program such as an employer-of-last-resort (ELR) program and/or other anti-recession measures—and not just long-term improvements in entitlement programs such as federal disability benefits—are still very much apropos.